What are boundaries? A simple way to describe the concept of boundaries in relationships is where I end, and you begin. They ensure each person in the relationship maintains a sense of self. When a person’s boundaries are weak or nonexistent, they are likely to compromise their sense of self, which can lead to feelings of anger or resentment towards self or others. 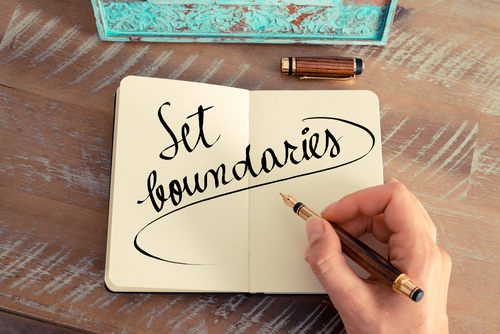 Boundaries can be physical, symbolic, or even both, and serve as guidelines for behaviors and actions in relationships. Boundaries are important in all relationships but essential in relationships with those who experience addiction. When a loved one is in their addiction, they are likely to push against your boundaries. Maybe they continue to ask for money when you’ve said no multiple times, extend their stay in your home past agreed timelines, disrespect your space, violate your trust, or even cross physical boundaries. When you hold firm in your boundaries, it forces that loved one to take responsibility for their actions and hopefully, seek help to change their behaviors. Addiction can turn family members into enablers, caretakers, scapegoats, and doormats. By setting the boundaries necessary to focus on your own well-being, you are taking steps to free yourself from the chaos that can come with addiction, and giving your loved one the nudge necessary to take care of themselves and their own recovery. When the sole intent is to help the loved one, it’s easy to forget that the word “No,” in and of itself is not only a complete sentence, but a boundary all unto itself. No, I will not give you any more money- for gas, rent, or food. No, you cannot come and live with us. No, we are not bailing you out this time. Boundaries need to be communicated to be effective. They cannot simply be assumed, or the loved one is left guessing at what is acceptable in the relationship and what is not. To set the boundary, tell your loved one how their behavior impacts you: “When you say/do this (specific behavior), I feel this way (emotions). If you continue to do/say (specific behavior), I will (take an action) to take care of myself. Boundaries must be followed through with to be effective. When you set a boundary with someone and then don’t follow through with that boundary, future boundaries will likely not be taken seriously. When initiating the process of setting boundaries, it is common to be perceived as the ‘bad guy.’ Feelings of guilt can be a withdrawal symptom of the tendency to put others’ needs ahead of your own. You may feel selfish in setting boundaries but try to remember that setting a boundary is self-care, not selfish. Remember, you are not alone. The disease of addiction has now reached epidemic levels. Chances are, you have friends, relatives, coworkers, or peers who are in the same boat. Talk, share ideas, support each other, get help. Chances are, this may be one of the most challenging experiences you deal with. You don’t have to do this by yourself. References Mellody, P. (2003, 1st Edition 1989). Facing codependence: What it is, where it comes from, how it sabotages our lives. New York, NY: Harper and Row.